, , : Place wager in point area (2 points per card). Textual description about X bonus points (you score points, when you play or use this card). Characteristics: additional card draws, bonus points. Requires: Dabo Girl, any Quark. 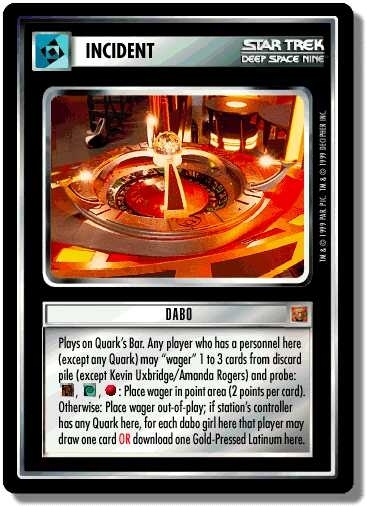 While you may have a copy of this incident in play on each of two Quarks Bars, you may not get probe results using both copies at the end of a turn. See cumulative, probing, Writ of Accountability. There are 25 entries for Dabo (ST1E 8 U 35) at the Tradeplace (52 haves and 3 wants). Click here to see all trade list entries for this Uncommon card!